Ginger Bread. (81) 1lb and a quarter of flour, 1 lb of Treacle, 1 lb of coarse Sugar, 6 ounces of water, lemon peel, and ginger to your taste Miss Sharpe. Lemon Beverage (or pop) (82) To six quarts of water, add one pound of loaf Sugar, Two ounces of ginger, Two lemons, and four spoonfulls of yeast, bruise the ingredients and pour the water boiling hot upon them, and when new milk warm, add the yeast, and when it begins to ferment, bottle it and tie it down. In twenty four hours it is fit for use. 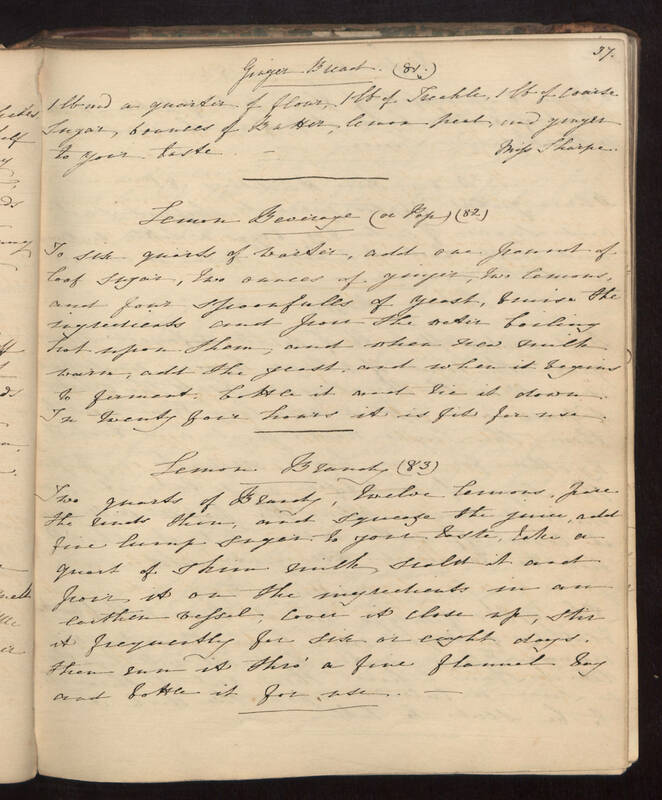 Lemon Brandy (83) Two quarts of Brandy, twelve lemons, pare the rinds thin, and Squeeze the juice, add fine lump Sugar to your taste, take a quart of Skim milk, Scald it and pour it on the ingredients in an earthen vessel, cover it close up, Stir it frequently for Six or eight days. Then run it thro' a fine flannel bag and bottle it for use.